I stood in front of the (almost) full display of Manhattan Hands Up! display in Austria and had really hard time choosing which shades should I leave in the store. In the end I bought 8 out of 20 creme polishes available. I’m packing for trip with friends and family to Croatian shore, so I’ll be super short today. Polishes are numbered, but Manhattan released names with promo photos, so I’ll write down both designations (that word always reminds me of Borg and Star Trek series ). Manhattan Hands Up! no. 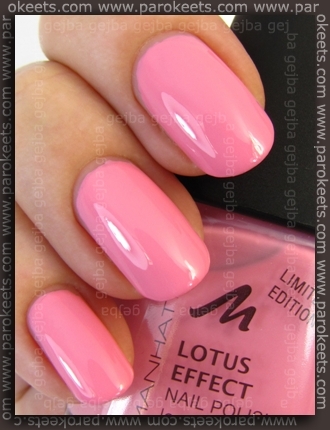 1 – Babelicious: I think this was the only one in the bunch with little bit tricky application. Think of medium hard pastel to apply. Shade is lighter pink. Manhattan Hands Up! no. 2 – Fresh-Excited! : for a pastel shade application was not so bad. With enough polish on the brush it posed no problems. Very light mint green shade (less yellow than in the photo). Manhattan Hands Up! no. 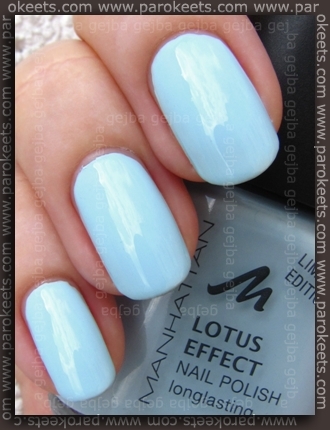 3 – Oh Heaven: baby blue shade. Manhattan Hands Up! no. 4 – Do You Twitter? : well I’m trying to but Twitter confuses hell out of me. 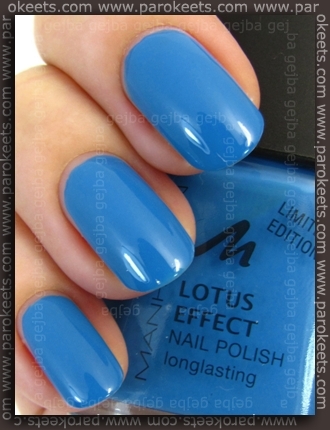 :D Love this gorgeous medium blue shade. No problems applying this one. Manhattan Hands Up! no. 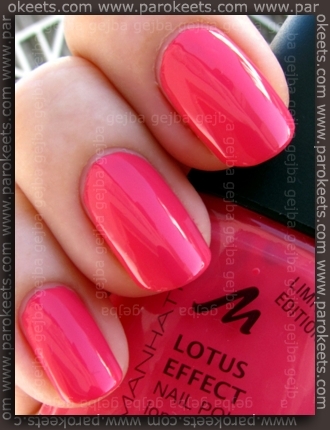 7 – SOHO-Hot: medium dark pink with coral undertone to it. Manhattan Hands Up! no. 11 – Lime It! 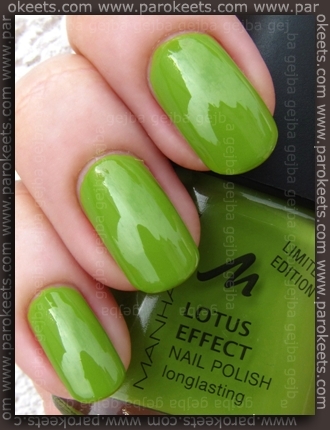 : poisonous green shade I used as a base for my rotten apple mani. :D Yellowish based green with non-problematic application. Manhattan Hands Up! no. 14 – Laguna Beach: I know, I know … I have tons of cyan shades and I still have to add another one of these beauties to my collection. Color is deeper/more saturated in real life. I paid 3 EUR for 11ml bottle in Austria. 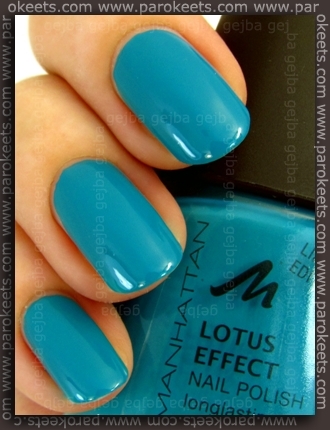 Any other shade you recommend from Manhattan Hands Up! LE? Lovely swatches and nails! I hope they won’t be more expensive in Croatia. Because if they’re 3 Euros, I’m buying 2,3 and 11! Lime it! in pa Green P eace me bosta najbrž premamila. Predvidljivo, vem. *wants so much* Excuse me while I drool over Lime It! Of course my usual DM didn’t have them yet. Sometimes it seems they’re weeks behind. Thank you for showing these off, now I know what to look out for these days. I’m wondering the same thing about the names on the labels. It’s annoying that they printed only numbers. Ow noo, I want them all, not all 6 of them, all 20 :(! I’m going to bankrupt :D.
Laguna Beach je definitivno moj favorit! divna nijansa! OMG!!!!! i love them all!! !